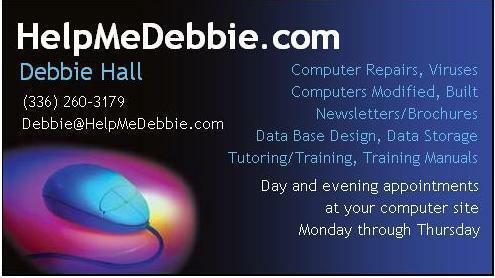 Debbie Hall, your computer assistant. My services are reasonably-priced and I come to your computer -- no need to pack and mail or drive your computer for service! I can help with a range of common computer-related needs. you need done, I will try to recommend someone who can. can't get it to work. I love trying to figure things out! Monday through Friday -- even in the evening. And ask me about my rates for special weekend service. When you need my telephone number, just visit this webpage! Currently I can come to most addresses in the Piedmont and Triangle areas of North Carolina. the best and busiest business group in Alamance County! Got a sick or slow computer? Virus software installation and scans. Hard drives replaced or added. Boards installed, new computers built. Data storage on CD available. or at a bulk printer location. Believe you might have a computer virus? Trying to send a newsletter? Want somebody to teach you something about your computer, in a gentle way? Wondering how to keep and access data on your computer or on a CD? If you need something done on a computer, ask if I can do it. Ask about special weekend service.